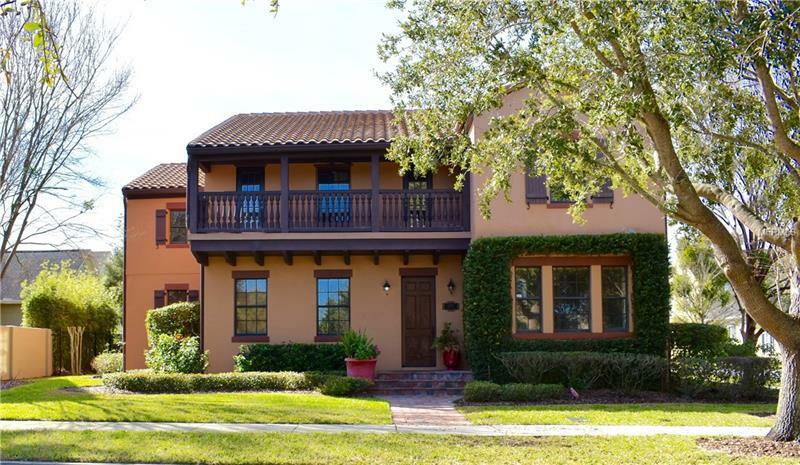 Beautiful Spanish elevation Estate Home with 1-BR Garage Apartment overlooking High Park Pond! Sprawling 2-story plan opens with elegant foyer open Living and Dining Rooms anchored by the hardwood spiral staircase with custom railings--the property's architectural centerpiece! Just off the front entrance is a large Study and powder room that could also serve as a 1st floor guest bedroom. In the center of the home is a large kitchen with TONS of cabinet storage Butler's Pass and large pantry. Stainless steel appliances include a subzero refrigerator. Steps aways from the kitchen is a beautiful Wine Cellar with custom iron door. Large center island in kitchen opens to the Family Room. First floor Master Retreat is off of private hallway and has french doors leading to back porch area. Master Bathroom is elegant with true walk in shower and HUGE master closet! Upstairs is large open Bonus Room and 3 additional Bedrooms each with ensuite Bathrooms and EVERY CLOSET is finished with custom built-ins. Backyard has plenty of room to add a pool and is also completely fenced with mature landscaping for privacy. 1-Bedroom Garage Apartment is currently rented for $1350/month and tenants may be willing to stay. Many upgrades that must be seen to be appreciated. And the water and park views are a true find! Very close to Lake Baldwin walk trail and quick bike ride to Downtown Baldwin Park or Winter Park High School.